Labyrinth walking is an ancient practice used by many different faiths for spiritual centering, contemplation and prayer. Entering the serpentine path of a labyrinth, the walkers walk slowly while quieting their minds and focusing on a spiritual question or prayer. It has only one path to the center and back out, described by the term unicursal (one line). It has no blind alleys or dead ends. The path twists and turns back on itself many times before reaching the center. Once at the center, there is only one way back out. In this way, it symbolizes a journey to a predetermined destination (such as a pilgrimage to a holy site), or the journey through life (from birth to spiritual awakening to death). There is no set ritual for walking a labyrinth, but there are books and lectures to assist you in performing a labyrinth walk. 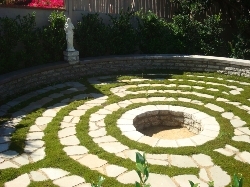 The basic advice is to enter the labyrinth slowly, calming and clearing your mind. This may be done by repeating a prayer or chant. Open your senses and focus on the process of taking slow and deliberate steps. Bring to mind a prayer or spiritual question to contemplate during the walk to the center. Reaching the center, pause to reflect, pray, listen for an answer or for deeper revelation. Now begin the return journey. Pray or reflect further. Before or after your Labyrinth experience, you are invited to visit the St. Joseph's Chapel and the "Upper Room" Spiritual Library and check out a book to take home.